The following features are common to all configurations of the Multi-SR. Input Power: The Multi-SR can accept one or two power sources in the range of 36 to 75 VDC. If two power supplies are used, they are logically OR’d on the Multi-SR so that the operating voltage is equal to the higher of the two supplies. The Multi-SR can supply up to 4.0 Amps to the fan load with natural convection or 5.0 Amps to the fan load with 200 LFPM of forced convection, at 24 VDC or 48 VDC. Fan Speed Control: The speed of all fans is varied by adjusting the fan voltage. Voltage adjustment is accomplished with a current mode buck/boost control circuit. The fan voltage range is 13-25 VDC for 24 VDC fans and 26-50 VDC for 48 VDC fans. Active Current Limiting: The load regulating circuitry is configured with a 10 Amp active current limit. At the initial application of power, a 10 Amp AC transient current having a duration of less than two milliseconds can be expected. This current transient can also be expected during a “hot-plug” condition, where input power is rapidly cycled. Input Power Fuse: A 10 Amp input power fuse is provided to protect the Multi-SR from over-current conditions. Soft Start: The voltage applied to the fans at start-up ramps from 0 to 13 VDC for 24 VDC fans and 0 to 26 VDC for 48 VDC fans. After this period, the fan voltage moves to the commanded voltage. This “soft start” feature limits the current spike common to DC fans at start-up. Communication of Alarm Status via I2C Bus: The status of each fan and the MINOR and MAJOR alarms is available on the I2C Bus. The Multi-SR includes user selectable features that allow it to meet a variety of telecommunication applications. The selectable features that must be specified by the user prior to ordering are listed below. Each Multi-SR is programmed prior to shipment with the features selected. Number of Fans: The Multi-SR can be configured to power and monitor 1 to 6 fans. 1) Temperature Based Fan Control: The speed of all fans is proportional to the highest temperature read by 1 to 3 remote sensors connected to header J17 or the temperature of one board mounted sensor. 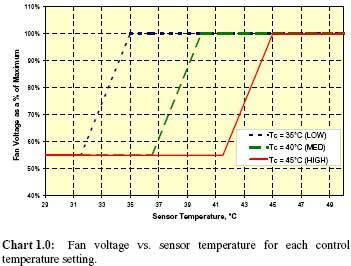 Chart 1.0 shows fan voltage as a function of sensed temperature. A shunt on header J15 is used to select the control temperature TC (The control temperature is the temperature at which 100% fan voltage is applied to the fans.). When temperature based fan control is selected, temperature sensor status is available on the I2C bus. 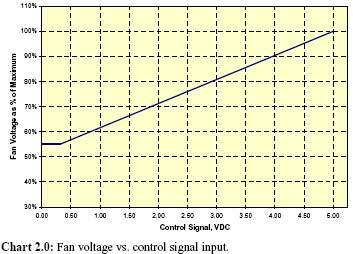 2) PWM/0-5 VDC Based Fan Control: The speed of all fans is proportional to the PWM/0-5 VDC signal applied to header J16. Chart 2.0 shows the relationship between the control signal applied at header J16 and the fan voltage. 3) I2C Bus Based Fan Control: When configured for fan control via the I2C Bus, the speed of all fans is mapped to the command sent through the I2C on header J14. See the Operation Section for a full definition of the I2C protocol. Number of Temperature Sensors: When temperature sensor based fan control is specified, the user can choose to control based on 1, 2, or 3 remotely mounted sensors or one board mounted sensor. On Board Isolated Power Supply: The user can choose to supply the 3.3 or 5.0 VDC power required to run the I2C Bus (header J14) or PWM/0-5 input interface (header J16) or specify that an isolated power supply be provided on-board. Contact Control Resources’ Application Engineering for details.